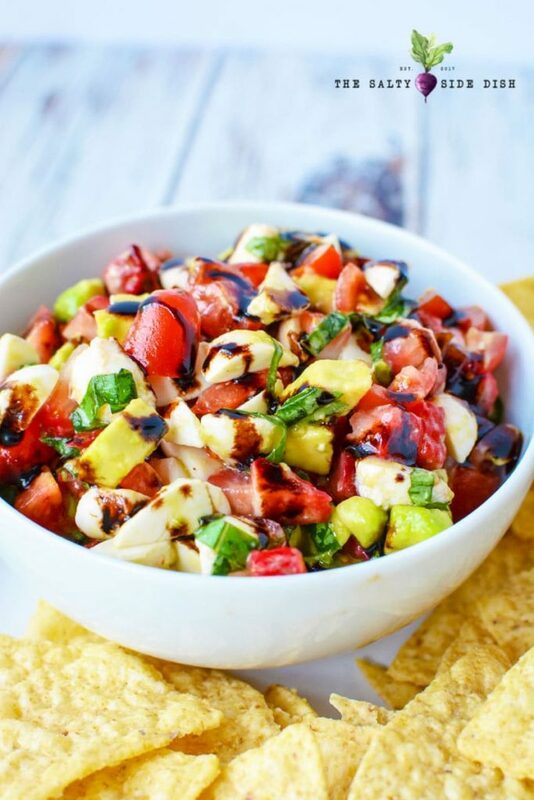 Caprese Salad Salsa is a burst of flavor in every bite! Incredible mini bites of tomato, cheese, and strawberries all folded into balsamic is an eruption of flavor in every. single. bite. Holy Moly, let it never stop. I could die happy just eating those three things the rest of my LIFE. And you may tell me tomatoes are high in carbs or whatever Keto is doing these days but I say NAY! 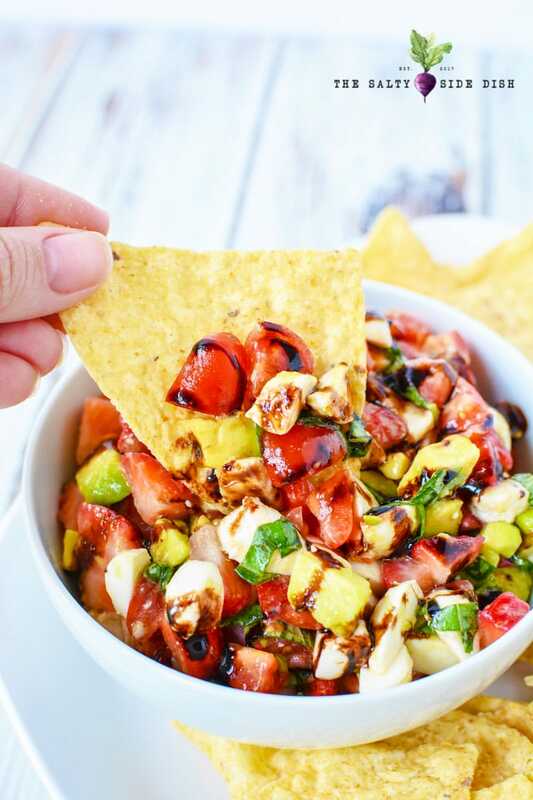 So making this Caprese Salad Salsa is like getting all your healthy servings in one glorious bite! Ok, maybe not all that, but it is delicious and you should make it right now. Here is the catch with making anything Caprese. The balsamic just murders how long it can be stored. 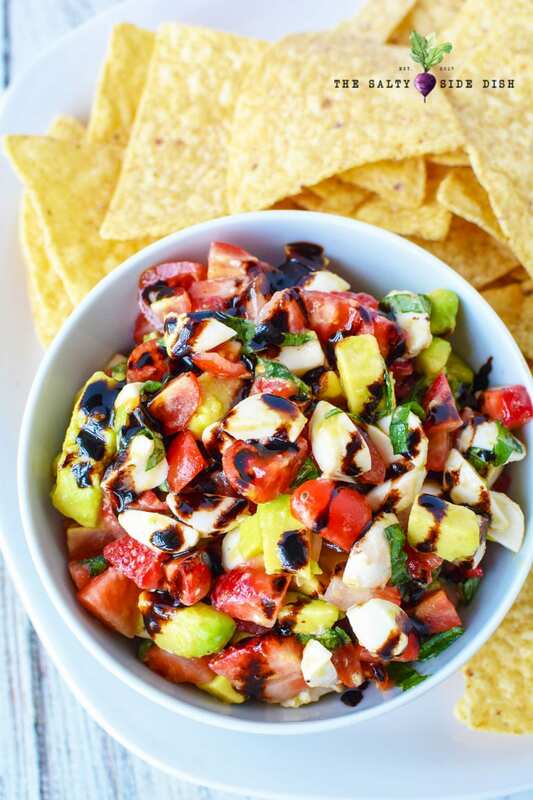 Meaning that if you are planning on making this for a party, cut everything up and wait for the serving point to add the balsamic drizzle or vinegar. And lets face it, avocado isn’t that trustworthy either and turns brown (although still tastes great). This is a make now, serve now dish. If you need something you can make up and serve later, try Pico De Gallo, Mexican Corn Dip, Ranch Pasta Salad, or traditional carrot salad. All great choices for parties and side dishes to carry. Prep is the name of the game for this dip! Make sure you cut down your ingredients into bite sized pieces so you can easily get a little of each onto a chip. This produces the best flavor! Good prep goes a long way in serving food. The cheese is Galbani Mozzarella Fresca, perline/pearl sized. You drain the liquid the then cut the balls into quarters. This makes about 3-4 cups of salsa. The time consuming part is the reduction. And maybe the cutting of the fruits/veggies. I would serve asap because of the avocado turning brown. I did double this reduction and saved half of it for an Appetizer Platter. Now, That worked fine. I poured it into a small dish and covered it overnight and just left it on the counter. The reduction actually tastes a little sweet. I think you could have this balsamic reduction done the day before and drizzle when ready to serve. Can you substitute Cheese in Caprese Salad? I mean you can, but why would you?? 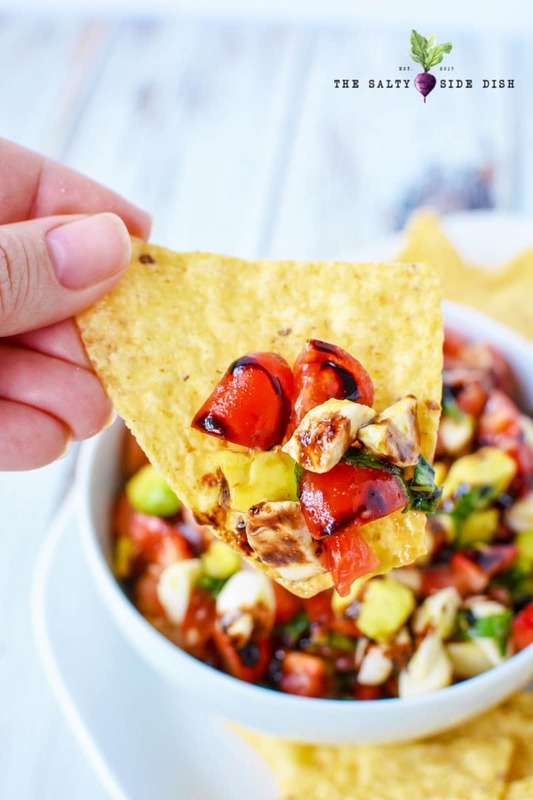 Call it a dip or call it a salsa, doesn’t matter, just call it delicious! 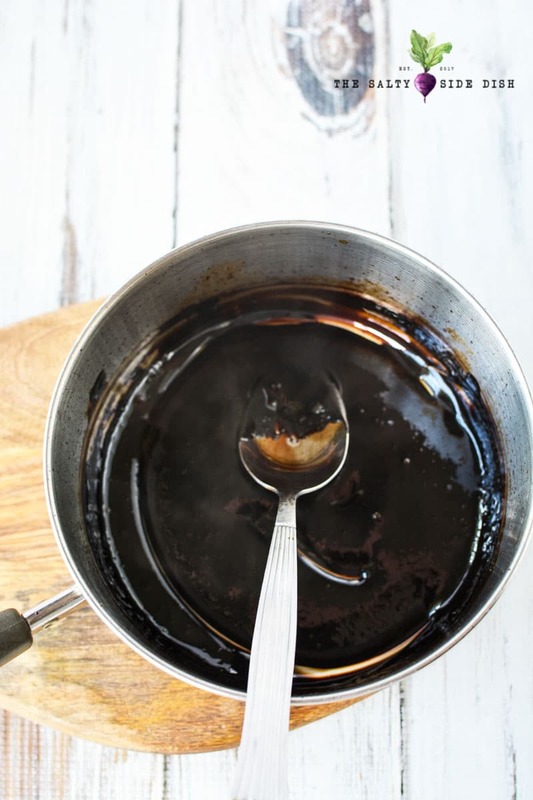 To get started you will need to first make your balsamic reduction. In a small saucepan add vinegar. Heat on medium low for 8-12 minutes. Stir occasionally until mixture begins to thicken. Mixture will continue to thicken as it cools. 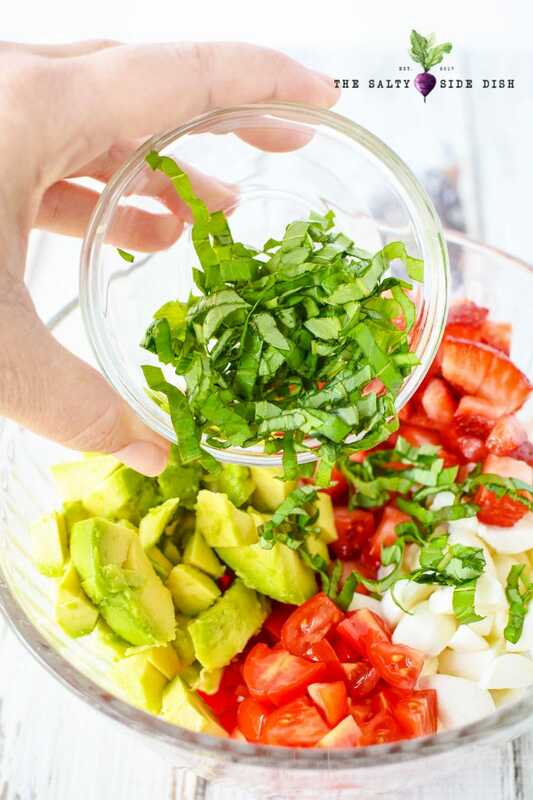 Meanwhile, In a large mixing bowl, add strawberries, tomatoes, cheese, avocado and basil. Place into a serving bowl and drizzle with vinegar reduction. Don’t forget to try the BEST Caprese Pizza Recipe too! In a small saucepan add vinegar. Heat on medium low for 8-12 minutes. Stir occasionally until mixture begins to thicken. Remove from heat and let cool. Mixture will continue to thicken as it cools. 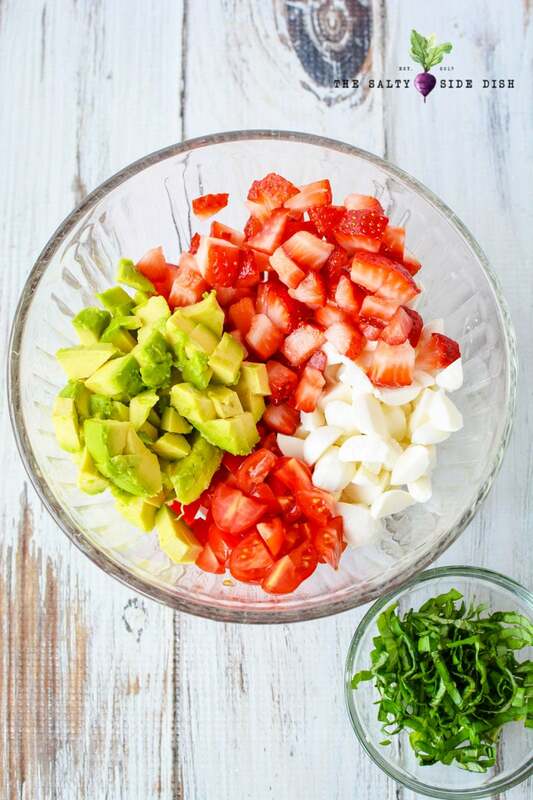 Meanwhile, In a large mixing bowl, add strawberries, tomatoes, cheese, avocado and basil. Stir to mix well. Drizzle with olive oil and season with salt and pepper. Mix well. Place into a serving bowl and drizzle with vinegar reduction. Serve immediately.